Even in today’s environment of fast-paced technological advancement, successful energy transition and system improvement will not happen overnight. Many policy and business decisions made now will not show their full impact immediately. Therefore, if countries want to increase the probability of meeting their mid- and long-term objectives, they must embark on their individual journeys with a sense of urgency independently from their starting positions and transition pathways. The Forum aims to publish the Energy Transition Index on a regular basis, to provide continuous transparency on individual countries’ energy system performance, and for countries to inform their national and regional energy transition assessments. Outcomes from these assessments could feed back into the ETI and contribute to its refinement. Moreover, the Forum aims to actively work with countries committed to define their transition visions and roadmaps. As the International Organization for Public-Private Cooperation, the Forum supports country-level transition efforts. It can serve as a catalyst and facilitator with its supportive platform to create inclusive engagement from stakeholders across the entire energy system and to foster good practice exchanges by connecting transition efforts globally. 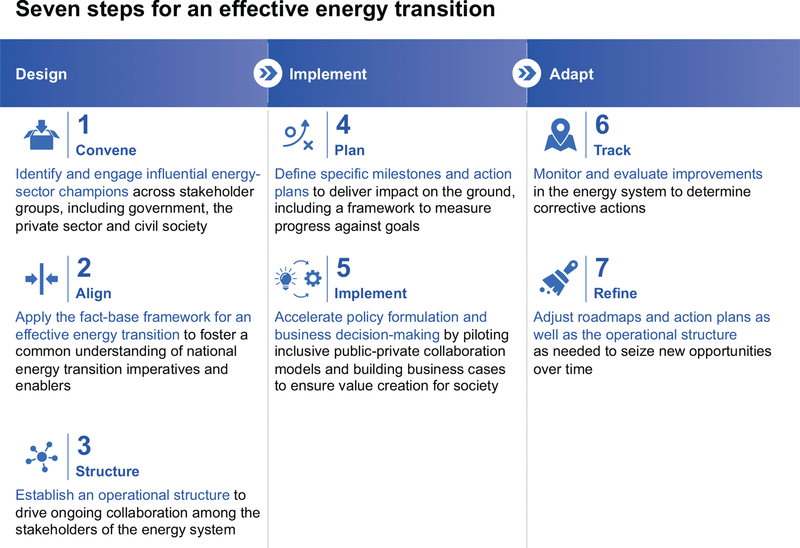 In-country transition efforts can draw from successful experiences and tested frameworks, adapted for energy system challenges (Figure 12). The coordination of country-specific transition efforts should be led by and fully owned by local champions, to ensure full implementation and long-term success. The Forum is confident that locally-owned, country-level action, built from inclusive, public-private cooperation and rooted in a common fact base will create value for stakeholders throughout the energy system and help accelerate an effective energy transition.